"Chancellor Appoints Disruption Policy Committees"
"Senate Acts on Student Requests"
This black and white photograph is an example of a very small tobacco farm. This is a rural setting in which the whole family is involved in the production of tobacco. This black and white photograph shows African-American women preparing and processing tobacco by hand, a method that is rarely used today. 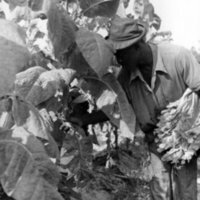 This is a black and white photograph of African-American farm laborers harvesting tobacco leaves. The laborers are men, women, and a child. Note also their reliance on draft power in the background of the photograph. This is a black and white photograph of a farmers controlling a mule drawn sled. They are using draft power to harvest tobacco leaves. This is a black and white photograph of an African-American farm laborer hand harvesting tobacco leaves. A black and white photograph of African-American farmers using a tractor and modern machinery to mechanize the tobacco transplanting process. This is a black and white photograph of men transplanting tobacco seedlings in a field. This image, taken in 2004, reveals both the proximity of NC State to Downtown Raleigh and the tremendous growth Raleigh has experienced in the past 50 years.